The Superior Mesenteric Vein is the portal vein‘s major tributary is. Its creation takes place in the right iliac fossa that joins the small veins coming from the ileocaecal region. 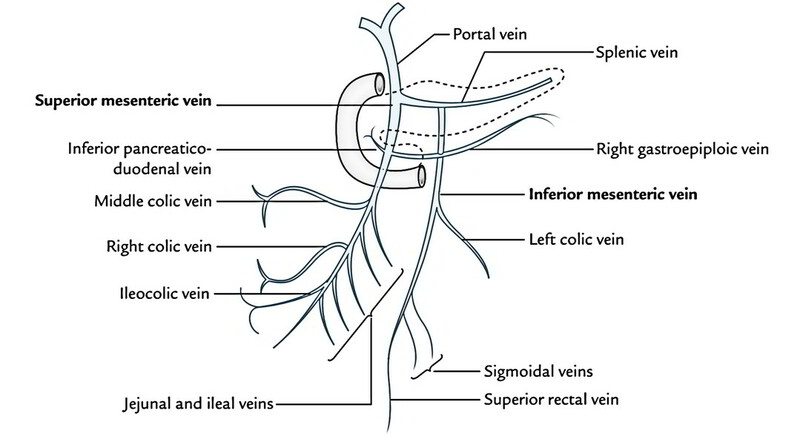 It goes in the upward direction along with the superior mesenteric artery (the vein being right to the artery) and ends behind the neck of pancreas by joining the splenic vein to create the portal vein. Veins corresponding to the branches of superior mesenteric artery. The superior mesenteric vein empties venous blood from the small intestine that is rich in nutrients, large intestine up to the junction of proximal 2-third and distal one third of the transverse colon, stomach, and pancreas.